The one-year-old California company says it can help installers attract customers and save costs through its software and service offerings. Sungevity entered the residential solar energy market as an equipment installer, but it has set its sights on being a software and service provider as well. The Berkeley, Calif.-based company has launched a software tool kit that it says can cut down the time and costs of designing a solar energy system, as well as generating a list of potential customers looking for local installers. Sungevity on Tuesday announced its first three customers whose territories spread out over Southern California: Solar Forward, Sequoia Solar and Sunpower Electric. "We are hoping our tools are able to save installers margins as well as saving money for their customers," said J.P. Ross, Sungevity's vice president of strategic relationships. Sungevity provides its own testimonial about the effectiveness of its new offerings. The one-year-old company has been able to save about 10 percent of the equipment and labor costs for each system, Ross said. The company used the software for about two-thirds of the 164 systems it has sold over the past year, he added. Those systems are typically between 2-kilowatt to 2.3-kilowatt in size. That means for most of the time, Sungevity didn't have to send someone to visit a potential customer's home in order to design a system that would fit the rooftop. Here is how the entire software package works. Sungevity offers a free quote via its website to consumers who fill out an online form, which asks for information such as their addresses, energy use and names of their utilities. Sungevity uses that information to look for satellite images of those customers' rooftops and then designs the systems accordingly. It then sends emails to those customers, who can log in to see the cost estimates. Sungevity provides the customer information to installers who have signed up to use the software and service. The installers take over the sales at that point by contacting those potential customers. Sungevity also provides the software for managing the customer database and for filling out the 50 to 70 pages of forms for permits and for applying for any state or federal incentives, Ross said. Generating customer leads and designing a system without having to visit a potential customer's home is key to shaving costs for installers. Many installers spend a lot of time visiting potential customers' homes without making a sale because consumers tend to shop around. About one out of eight to ten leads turn into a deal, Ross said. Providing software that can quickly fill out the myriad of forms also makes a big impact. Some installers said dealing with paperwork could cost them $1 per watt (see Paperwork: The Added Cost of Solar Installation). The company would only match each customer with one installer. Serving installers who have overlapping territories can be tricky, then. Ross said the company will figure out ways to divvy up the leads fairly. Sungevity still plans to be an installer in the San Francisco Bay Area, though it certainly hopes the software and service business will generate good money. So for now, the company doesn't plan to use its new software to sign up other installers in the Bay Area, Ross said. "We designed the solar platform to be an increasing proportion of our revenues," he added. 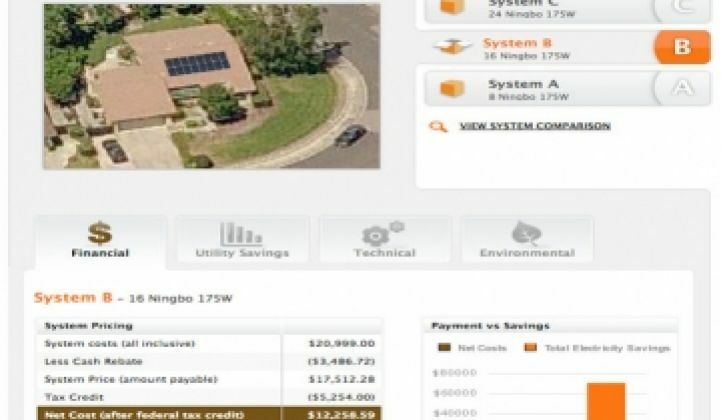 The company is charging the installers a fee to engineer a solar energy system, as well as a percentage of the sales. Ross declined to provide the figures. Sungevity will have to step up its marketing efforts to entice consumers to get a quote. There already are a good number of websites that offer to match homeowners with installers, such as Find Solar. Some installers, such as SunRun, also have their own free-quote offers. Some of the larger installers have already bought or developed software for the pesky task of filling out forms for solar incentives and permits. SolarCity, for example, said it has its own automated process that keeps the paperwork cost at under $1 per watt.